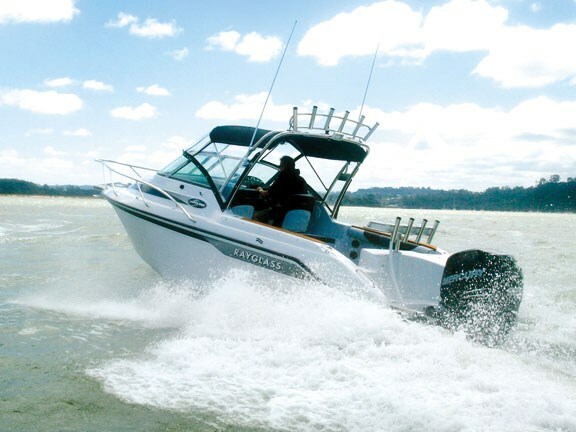 Thanks to its focus on simple and smart design features, the Rayglass 2300 is a genuine recreational all-rounder able to cater to a wide range of activities. 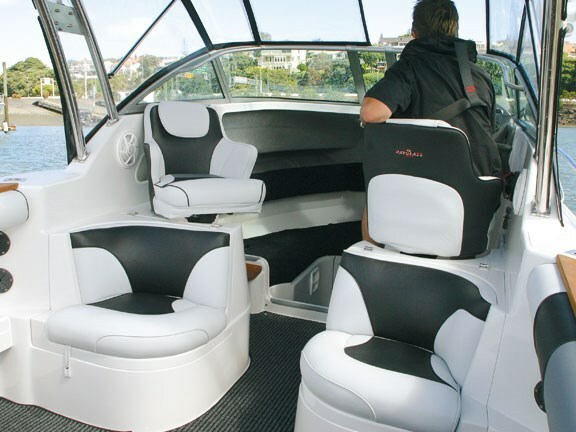 Highlights include ergonomic seating that cushions and supports the body to eliminate the discomfort of ploughing through wind against a tide chop. An intelligent windscreen with an integrated stainless steel dodger effectively protects front and rear seat passengers from wind chill and provides a solution for overhead rod storage. Then there is the generous topsides and raised forward cabin-side combings that channel wash aft and overboard while increasing sitting headroom in the cuddy cabin. There’s the electric toilet concealed in a moulded compartment in the cabin that is no more challenging to use than a domestic loo; an optional hot-water shower plumbed through an outboard engine heat exchanger and enough fresh water tankage to make it practical. The Rayglass 2300 has a seamless cockpit design moulded in a way that is not too dissimilar to a chilly bin. Generous cockpit covings and large moulded radiuses around the cockpit seats allows for easy cleaning because there are no awkward corners or angles for bait, scales and other nasty things to cling on. Cleaning up is a simple matter of taking the pre-plumbed wash down hose from its transom locker and hosing out. 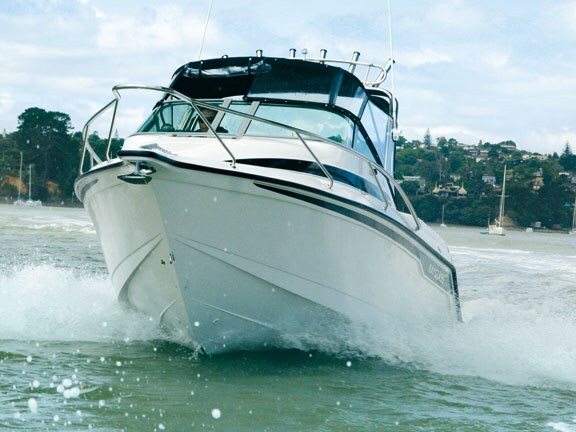 Deep moulded locker channels direct water to the bilge sump where it is pumped overboard. 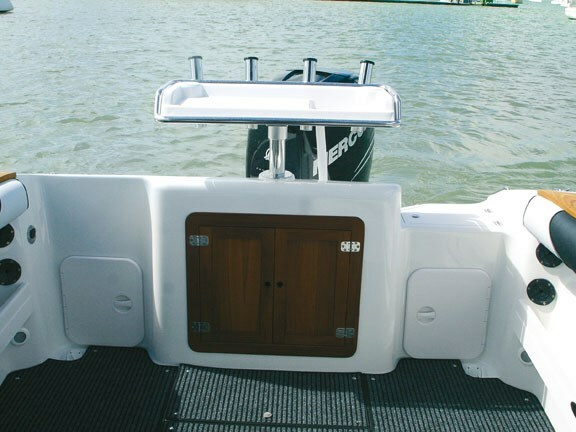 Storage options abound on the 2300 but it is the under-floor cockpit lockers that add the greatest value with a matching pair of large removable plastic bins designed around dive bottle dimensions. These keep the weight of bottles, dive belts and other equipment low, which aids stability both on the hop and at rest. Additional cockpit storage is provided under the transom, under the hinged bases of the queen passenger seats and within smaller accessory lockers moulded into the cockpit liner. 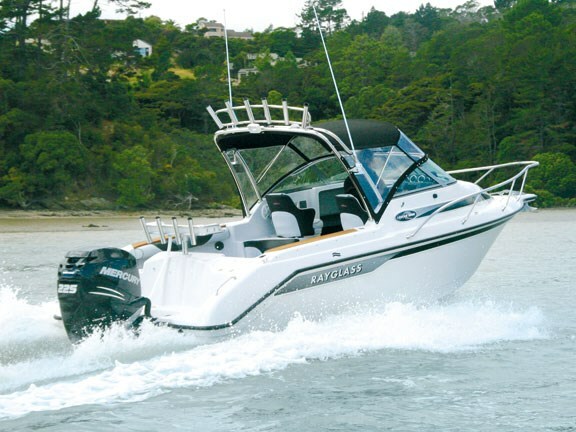 Rayglass Boats sales consultant Scott Little says the internal volume of the 2300 is what initially attracts buyer-awareness and is comparable in many respects to the larger Rayglass 2500. "Both models share the same external beam which at 2.45m [eight feet] provides generous volume and design options while maintaining aesthetically pleasing overall dimensions." Rayglass has further enhanced cockpit volume by eliminating internal mouldings. This has allowed Rayglass designers to extend the cockpit floor the full width of the hull. Rod storage is still an option with recessed rod holders fore and aft but there are better options elsewhere. 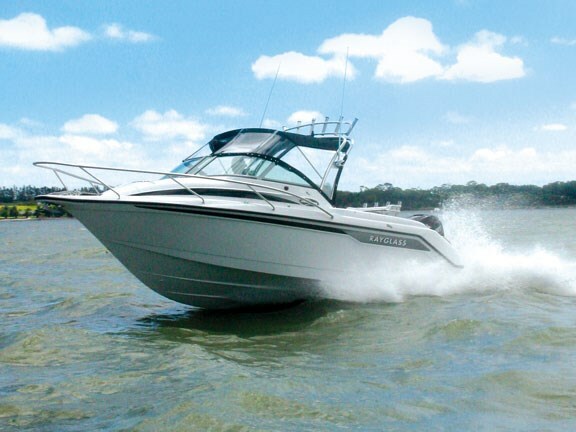 The 2300 transom design is built around anglers’ needs with optional circulating live bait tank and wash down facilities housed in moulded lockers on the outboard end of the transom, completed with a central self-draining bait board. The clean-up sink unit on the port aft side forms the mid-height cockpit transom walk-thru for easy on/off access to the aft boarding platform and stainless steel boarding ladder. The 2300 is a sharp all-round package with colour-matched graphics, stylish two-tone upholstery and pragmatic design. 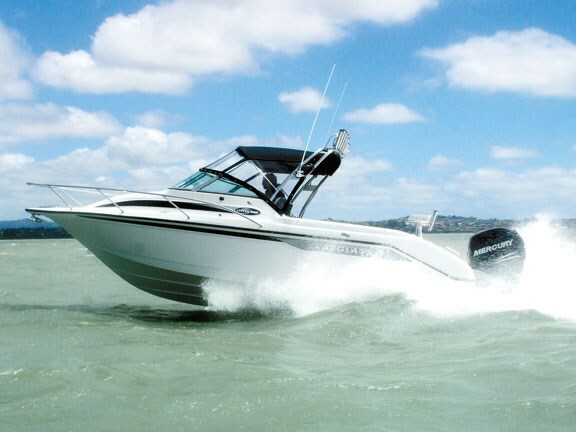 Little says there have been incremental changes to the 2300 throughout its production history but these are minor in their nature and centre around improved hardware options including an upgraded electric winch, front hatch and helm station console reflecting the shift to larger multi-function electronics. "Design-wise the 2300 hasn’t changed and there are no plans to do so. 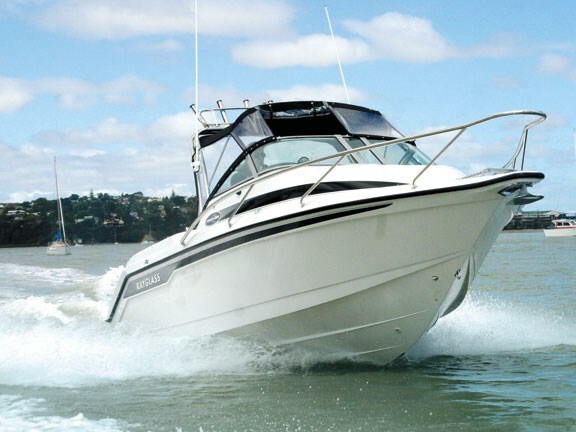 We regularly quiz our customers about our boats performance and handling characteristics and if we identify issues we deal with them. "Client feedback tells us the 2300 handles and performs very well with a range of power options and we’re of the belief that is something’s not broken then don’t fix it." 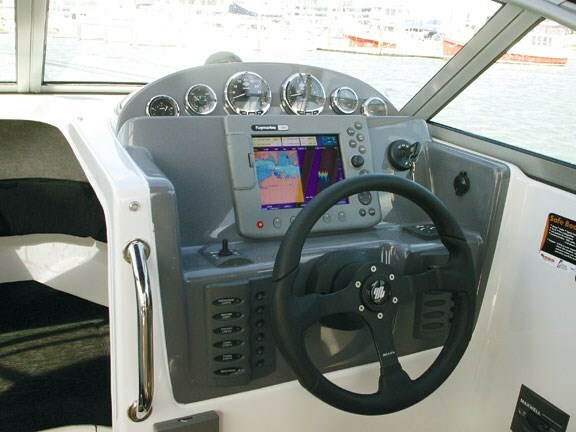 Highly-spec’d for the recent on-the-water boat show, we were treated to a brand new boat saddled to the latest generation Mercury Verado V6 four-stroke engine with fly-by-wire electronics and dual-function digital/analogue Smart Craft instruments. It was not an ideal day for boating with a fierce ebb tide and fresh breeze combining to create an uncomfortable chop, but there was no protest from the 2300, which begged for a little white water action. In fact, the Rayglass performed almost too well as we struggled to keep pace in the photography boat. Hard as we might, the boat ate up all we could throw at it and did it in a no fuss manner that exudes confidence and predictability. 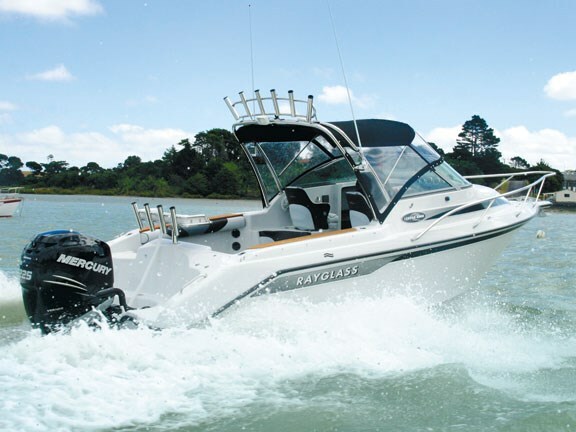 See a range of Rayglass boats for sale.